Rose is an old soul. She has been on earth more than 35-million years and she has walked intimately with humans throughout the rise and fall of civilizations. Her influence appears in art, poetry and song. No other flower has had as many admirers or has been as written about. Rose is a symbol of completeness with strong roots, perfect flowers, straight and strong stems and thorns that symbolize the spice and challenge of life. People have brought her in during moments of greatest joy and grief. She speaks when we are at a loss for words. She is a symbol of love and grace. Rose blossoms have come early for us this year. The week of 80 degree weather in April pushed everything forward. I scurry to take in the moment and fill my baskets with soft pink blossoms. Their fragrance carries me throughout the seasons. Rose is, without a doubt, one of my favorite plants – a teacher and a friend. Each year I rediscover her through making medicine, reading poems, swapping stories, and searching for new pearls of wisdom. For a full post on Wild Rose click here. When someone sees an apparition of the Virgin Mary or the Virgin of Guadelupe, they often say that they smell rose first. 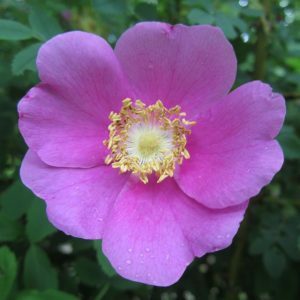 Rose is intimately connected with the Divine Mother and is used during times of transition including birth and death. In Mexico midwives do a ceremony where they anoint babies with rose and wrap them in a blanket to seal the spirit into the body. Many native people in the Pacific Northwest place rose branches over a baby’s cradleboard to protect it. They are also used in many cultures to anoint those who have died and those who have been left behind. Rose reins as Queen of Flowers and the most precious of all heavenly scents, but she is also a fierce protectress. She can open the heart and refresh the soul.